The November 15, 2018 Consortium webinar presentation was entitled “Overcoming Financial Problems in an Integrative Cancer Center.” Presenter Susan Yaguda, BSN, MSN shared experience data from North Carolina’s Levine Cancer Institute. Yaguda, the director of the center’s growing integrative program, spoke favorably of group visits both via shared medical appointments and in delivery of acupuncture services. It is the latter on which she shared the intriguing experience data. In many hospitals, hiring a first acupuncturist creates access problems. The center’s start small. More people quickly want the acupuncturist than hours scheduled. 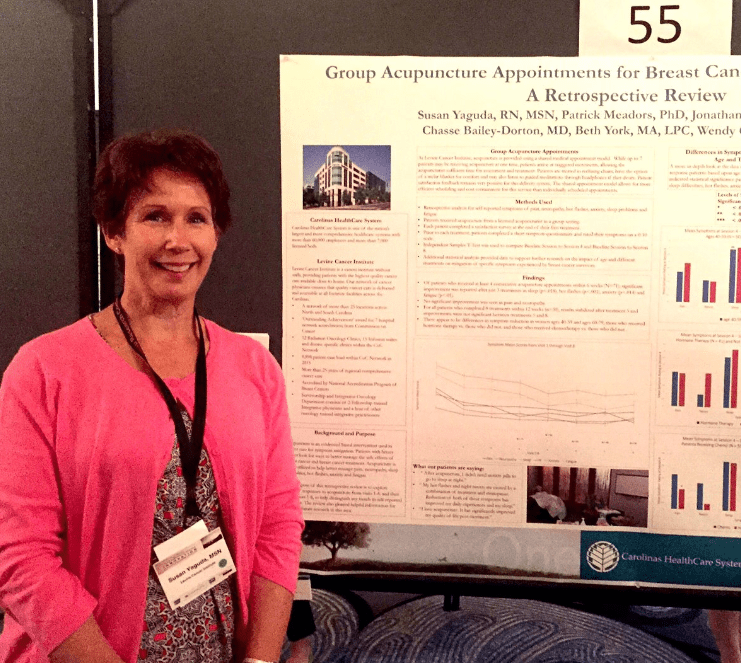 Levine responded to the pressures on their acupuncturist by beginning group acupuncture services. This solution for access proved a boost for income. Some of the 1st quarter 2015 over 1st quarter 2014 growth may be accounted for merely by increasing awareness. Yet the data are compelling. Visits increased 275%, income by 180%, and the per hour worked income by 102%. 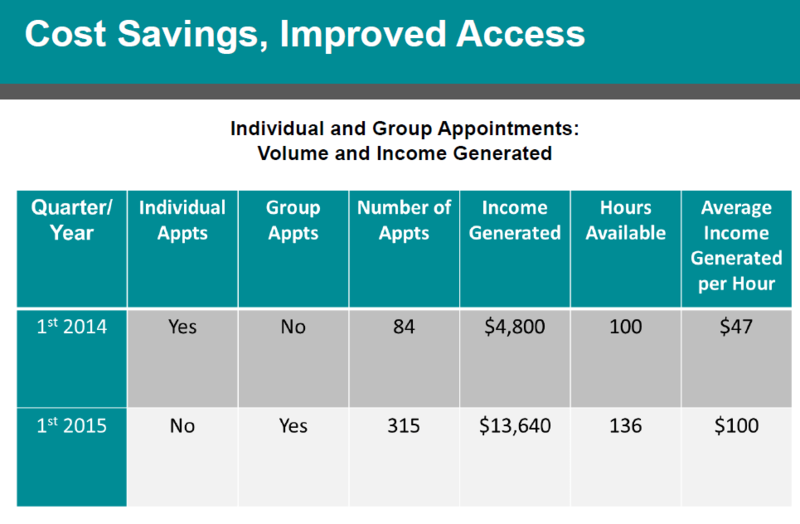 All this happened in a schedule in which the available hours for acupuncturist services only jumped 36%. Levine began with 1/2 day per week of an acupuncturist’s time, doubled that to a full day, then added another half day. With continued growth they presently offer the services two full days per week. They treat anywhere from 10-28 patients per shift. In April 2020 when the cancer center expands to a new location, the center will have 4 days per week of acupuncture services. An emerging mosaic of clinical evidence supports vastly expanded use of group services to deliver optimal care – especially in integrative health and medicine models. The picture is compelling. Many well-researched integrative programs are group delivered – those from the Benson-Henry Institute, Centering Healthcare Institute, Ornish Reversal Program, and mind body interventions such as Mindfulness-Based Stress Reduction, yoga, and tai chi. We see access to services among economically-challenged, multiethnic populations who cannot otherwise access integrative care. We see emerging evidence of cost-savings and of increased satisfaction among practitioners who have a clinical component of group work. Strategies for behavioral change show a facilitative leadership style with opportunities for interactivity and experiential learning are more effective methods of learning, of engagement and of empowerment. For the values of integrative health, we see tremendous alignment. The special issue has two partner organizations in Integrative Medicine for the Underserved (IM4US) and Centering Healthcare Institute. The project is being advised by Jeffrey Geller, MD with the Greater Lawrence Family Health Center, Stephanie Taylor, PhD with the Veteran’s Administration, Darshan Mehta, MD, MPH with the Benson-Henry Institute and Tom Trompeter, CEO for Healthpoint and board member for the National Association of Community Health Centers. The co-editors announce their goal to “create a volume that will serve as guidance for increasing appropriate uptake of innovative group services in health-oriented payment and delivery of the future.” Papers are due February 28, 2019 for a planned publication in July 2019.